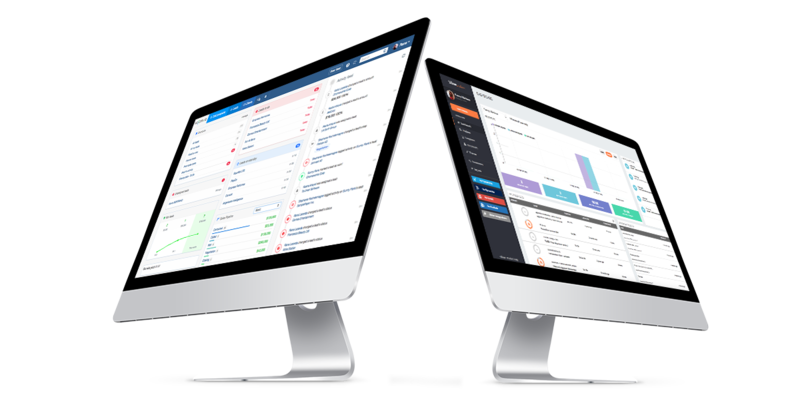 noCRM.io is a sales pipeline management tool that offers an alternative to classic CRM systems. It enables you to keep track of your leads and focus on the next action. Check out our page which explains the integration. In order to link up Tilkee and noCRM.io you need an account on both tools. >Create an account on noCRM.io here. >Create an account on Tilkee here. Make sure that the email address used for both tools is the same. Send an email to Tilkee’s technical team: “technique@tilkee.com” and ask for our API key. Head to the Admin panel on noCRM.io and select the Tilkee integration. Enter the API key into the space provided. Click on the ‘connect my Tilkee account button’. How do I link a Tilkee project up to a lead? 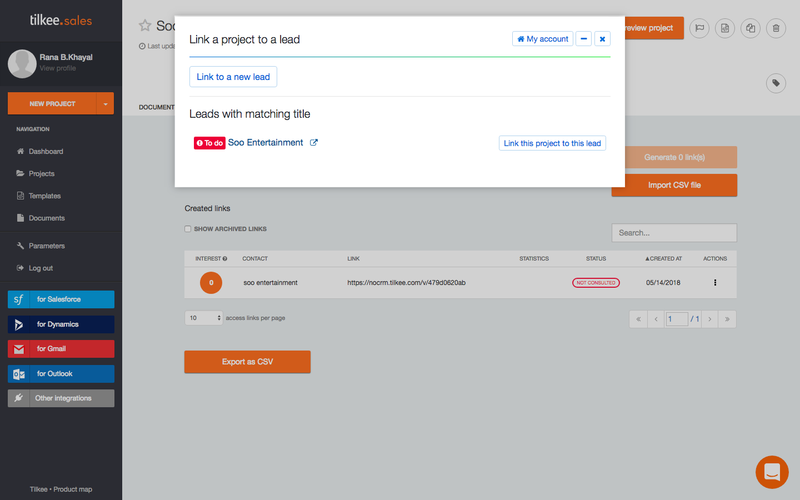 Login to your Tilkee account and click on the project you wish to link the lead with. The name of your project needs to correspond with the name of your lead. If this isn’t the case, you just need to rename your project. Click on the “Generate an access link button”. Install the noCRM.io Lead Clipper into your browser’s toolbar. Click on the +Lead button. A new window will appear showing the list of leads which correspond with the title of your Tilkee project. If no leads correspond, you can create a new lead which you can then link to the Tilkee project. In the Actions menu of your lead select “Create a Tilkee project”. In another window open your Tilkee account and click on the new project in order to add documents. How can I send documents with Tilkee via my noCRM.io account? 1. Make sure that your Tilkee project has already been created and linked up to a lead. 2. 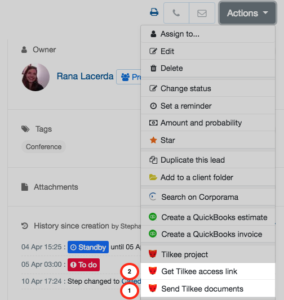 Click on the Actions menu and choose “Send documents using Tilkee”. If you’ve correctly set up your computer’s default messenger/email, an email pre-filled with your prospect’s email address and a Tilkee access link giving your prospect access to the documents, will open..
3. If you haven’t properly set up your computer’s default messenger/email or if you would like to use another channel to send your Tilkee access link, select “Get a Tilkee access link”. Copy and paste this link manually. How can I use the e-signature? With Tilkee you can use the e-signature. This enables your clients to sign your quotes and contracts online. Once your project has been signed, the corresponding lead in noCRM.io is marked as “Won”. The e-signature is charged at €1 / signature. We also offer packs of signatures. Please contact us if you’re interested. Each time one of your prospects reads your documents sent via Tilkee, you will be informed by email. Your lead will be automatically updated on noCRM.io with the activity “Document seen” logged. 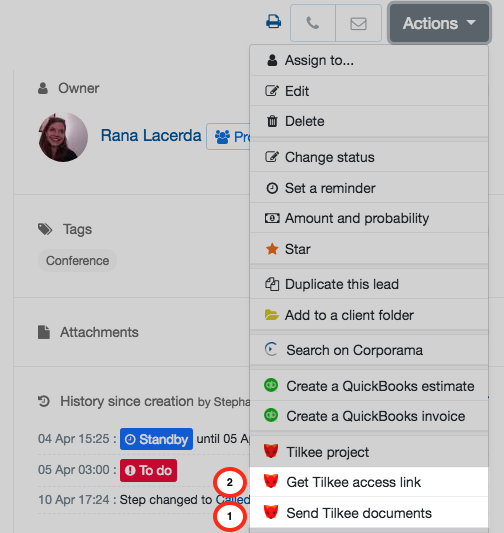 Once your Tilkee document has been signed, your lead’s status will change to won. You can also monitor all the leads that have either seen or signed your business documents on your noCRM.io dashboard. Manage your sales pipeline and boost lead conversions!